One of the growing needs for people looking to buy a fitness machine for their homes is to be able to exercise while also doing their work. This dual purpose need in an exercise machine is because of the fast-paced nature of our world. Today, not every person who works in an office has enough time to be able to workout because the daunting and demanding nature of their work either keeps them too busy or drains them from too much energy to be able to take out time for exercising. But because fitness brands know of this growing need, they constantly innovate and try out new designs where a busy person can attend to their work while also enjoying the benefits of exercise. After all, who says one cannot do both? For this purpose, we’re going to talk about a special semi-recumbent bike that has a work desk to help you achieve both things. 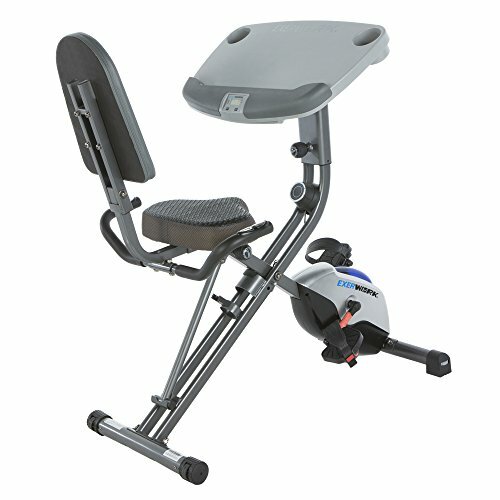 And it comes from none other than Exerpeutic, a quality manufacturer of affordable exercise machines. This bike is known as the Exerpeutic ExerWork 1000 exercise bike. 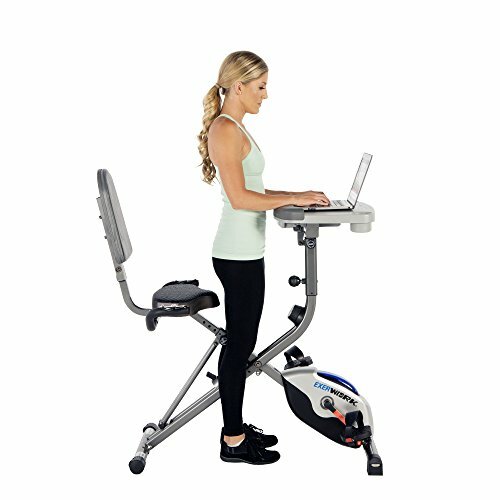 With eight magnetic resistance systems, a smooth and quiet belt drive, a comfortable and spacious seat, and of course a work desk for your laptop/kindle/tablet, the Exerpeutic ExerWork 1000 is a pretty solid semi-recumbent bike that will appeal to your needs. When fully assembled, the bike measures at dimensions of 45.3” x 25” x 51.3” of length, width, and height respectively. It can also be folded away for storage when not in used. When the bike is folded, it has a foot print of 21.3 (L) x 25.5 (W) x 54 (H). As for the weight of the bike itself, its total weight is 64.7 lbs and has a maximum weight capacity of 300 pounds and can accommodate users between heights of 5’2” and 6’3” to use it easily. This means that the ExerWork 1000 is good enough to let most users within that weight range and height to use it effectively. Built-in transport wheels at the bottom of the bike make it really easy to move it around from one room to another. Because the main selling point of this bike is a spacious desktop that can be used for multiple purposes, let us delve a little into that. The desktop is fully adjustable and is capable of forward, backwards, up and down adjustability which makes it convenient to use while you’re both sitting or standing. The desktop can be adjusted in 3 different angles of 0°, 16° and 33°. You can also make 5 height adjustments ranging between 41 inches to 45 inches for ease of use. The work desk itself measures at dimensions of 24 inches (W) x 16 inches (H). It is sturdy enough to withhold objects that weigh up to 44 pounds which means that you can easily place your phone, tablet or laptop on the surface while you are exercising on this bike. The display on the ExerWork 1000 is pretty basic and only tracks vital exercise readings such as total speed, time, distance covered, number of calories burned, odometer, scan, and heart-rate of the user. The display however is small and not backlit so it will be difficult at times to track the readings in low light situations. However that can be made somewhat easier by reclining the seat closer to the display. Beside the desktop you will also find ergonomically designed handlebars that are fitted with Hand Pulse Sensors. These sensors relay readings of your current heart rate to the display which you will then be able to see. Close to the handlebars and right beneath the front support below the desk, you will find a knob that is easy to reach and lets you choose between 8 different levels of resistances. The knob is adjustable and by turning it you can alter the tension in the knob and subsequently increase or decrease the total resistance in increments. Using this feature, if you increase the resistance you will have to pedal harder in order to burn the weight. Similarly, if you decrease the resistance you will have to apply less force when pedaling which will result in a much simpler workout. Do note however that the 8 levels of resistance means your workouts will only be of moderate difficulty and not athlete-level physically daunting. After all, this is a bike for those who like to work out while using their laptops and tablets, and definitely not for seasoned athletes looking to try out for the Olympics. It is therefore recommended to keep expectations reasonable. The ExerWork 1000 model is equipped with a V belt drive system and a balanced flywheel, as well as a 3 piece high torque crank system that promises for a good and smooth pedaling. You can rest assured knowing that the bike will make minimal noise and thus remove the risk of disturbing others living in the house. It’s so low noise that you can easily watch TV to it or read in relative peace. The Exerpeutic ExerWork 1000 features a wide and spacious 2.5” thick AirSoft seat that measures at 11” x 15” of length and width. The seat uses an aerodynamic design that distributes weight effectively and makes it comfortable to sit on for long stretches of time. The design also ensures that the seat will remain cool after many hours of use. The angled backrest however is 1.3” thick though not as comfortable because of the thinner padding. That is one slight flaw that we found with the bike’s design. However folding up a towel or two or simply placing a cushion behind your back will massively improve the comfort. So with most of the essential features now explored, let us weigh the pros and cons of the ExerWork 1000 to see if it holds up well to its promise or not. 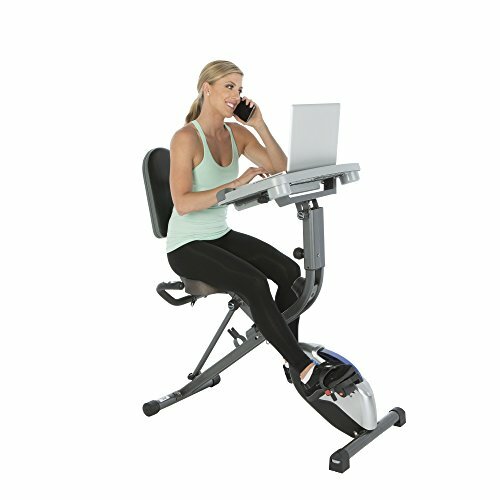 It is important to know beforehand that the ExerWork 1000 is not designed for serious athletes but is rather a dual-purpose bike that is suitable for the average person to use at home or in the office so they can stay fit, lose weight and tone their lower body. The desk surface is spacious and delivers what it promises. The bike is well made and the drive system gives it a really smooth and fluid operation. If you know what you’re paying for then it’s guaranteed that you’ll be pretty much satisfied with this bike.